As the days grow a bit warmer and sunnier, it’s quite tempting to throw the year’s first drinks party on the balcony. 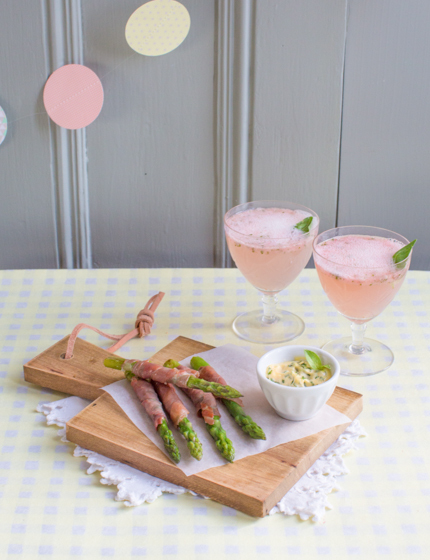 So, here’s the perfect fingerfood and cocktail to go with a springtime get-together. I’m using lovely seasonal ingredients: asparagus and strawberries, and pairing them with Luxembourgish crémant, mayonnaise and ham. If you’re not in Luxembourg, you can of course swap them for produce from your region. 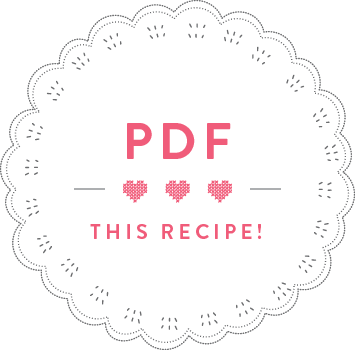 I created this recipe for the Luxembourgish food magazine Kachen. From now on, you will find a party snack and drink recipe from me in every issue. Wash the asparagus and cook in salted, boiling water for 3 minutes. Drain and immediately rinse under a cold, running tap (this will seal the vibrant green colour). Cut the ham slices lengthwise in two and wrap each length around one asparagus spear. Heat the olive oil in a frying pan and fry the ham-wrapped asparagus for 3 minutes or until the ham starts turning crispy. Meanwhile, mix the mayonnaise with the basil. Peel and crush the garlic clove and mix with the mayonnaise. 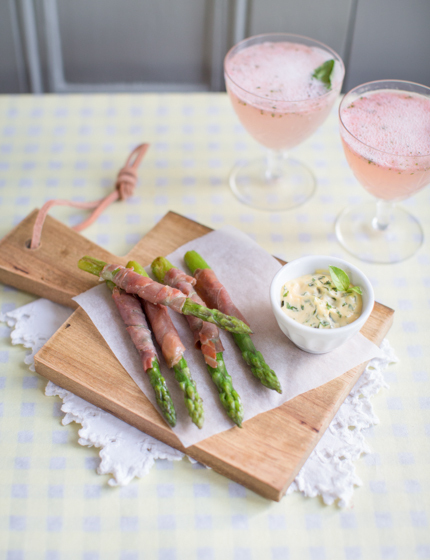 Serve the asparagus spears while still warm or cold, with the basil mayo as dip. Wash the strawberries and cut off the stems. Put into a blender with the vodka and the basil leaves and purée. Put 2-3 teaspoons of strawberry purée into each glass and top with crémant or bubbly. Voilà une entrée qui me plait beaucoup. L’apéritif est aussi original que joli.